Frida Kahlo is a world-renowned artist for good reason. She is one of the few Mexican artists to gain idolisation on a global level and her work – deeply embedded in her Latin heritage – is a reflection of her womanhood and her culture. But the image of Frida Kahlo that now resides in the zeitgeist, is a pale comparison to the actual woman herself. Literally. Whitewashed Snapchat filters aside, the bizarre appropriation of Frida Kahlo is a topic that has been brought up again and again by Latina women and people of colour. The main question being: why can’t you just leave her alone? Like other heralded people of colour, it seems as though Kahlo’s identity is only palatable as a bite-size appetiser. The kind you’d probably find at an upscale charity event attended by rich white women. Frida Kahlo’s commodification has been a quick and brutal one; from socks to macrame wall hangings, you can get literally anything with Kahlo’s face printed on. This in itself isn’t necessarily a problem, in fact, it’s to be expected. 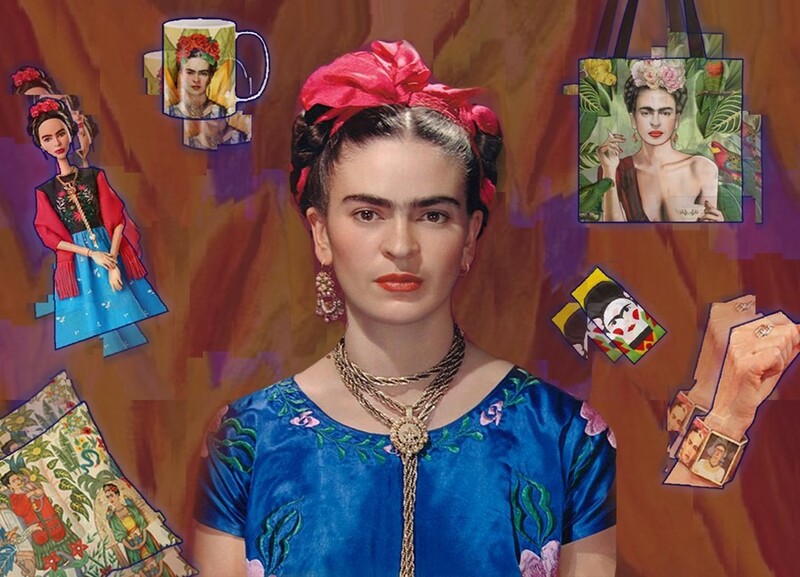 Much like Vincent Van Gogh and Pablo Picasso, Kahlo has gained a kind of sainthood that usually takes place after an artist’s death. It’s natural for people to want to have a piece of these visionaries, gone too soon. But unlike male artists, her commodification has taken a strange turn. While Van Gogh is revered for his misunderstood genius and Picasso for his innovation, Kahlo seems stuck with being praised for wearing a bold lip and not shaving. Surface level reverence proves dangerous in a time where "girl power" is so obviously being used as a marketing tool. There’s a righteous, constant need for representation of women, disabled people, queer people, and people of colour in the media. And while representation for minority groups is fast on the rise, it is still heavily lacking – so much so that you end up feeling like you to have to take what you can get. It’s becoming an increasingly hard pill to swallow, especially as often, the underrepresented are excluded from the process of telling their own narratives. For every Daniela Vega, there are ten Jared Letos. It happens so regularly that it’s hard to gauge if the people behind the scenes have good intentions, even if they are supported by the mainstream. Ultimately though, Hollywood studios and big corporations will go where the money, is and it’s naive to think that they have our best interests at heart. Major support for feminism is currently at its peak with the Time’s Up and #MeToo movements. Demand for equal pay is rising amongst the Hollywood elite and more and more cis men’s Twitter bios state that they’re a “proud feminist” (no applause necessary). Through the trickle down, the gravity of movements like Time’s Up and Me Too gets reduced to hashtags and wearing black – the absolute minimum. The same can be said about Pride and its own commercialisation and gentrification. People can get all the points for being radical, without pushing boundaries at all. This seems to be the legacy of nouveau white feminism, pushing the boundaries but only so far and to their own benefit. It’s ironic then that Frida Kahlo has become one of the stock faces for this lukewarm movement. Alongside Maya Angelou and Hillary Clinton, she is constantly cited as a certified phenomenal woman – even our beloved Queen B paid homage a few Halloweens back – but the watered down narrative that goes along with this image of her is not the one that she made up for herself. 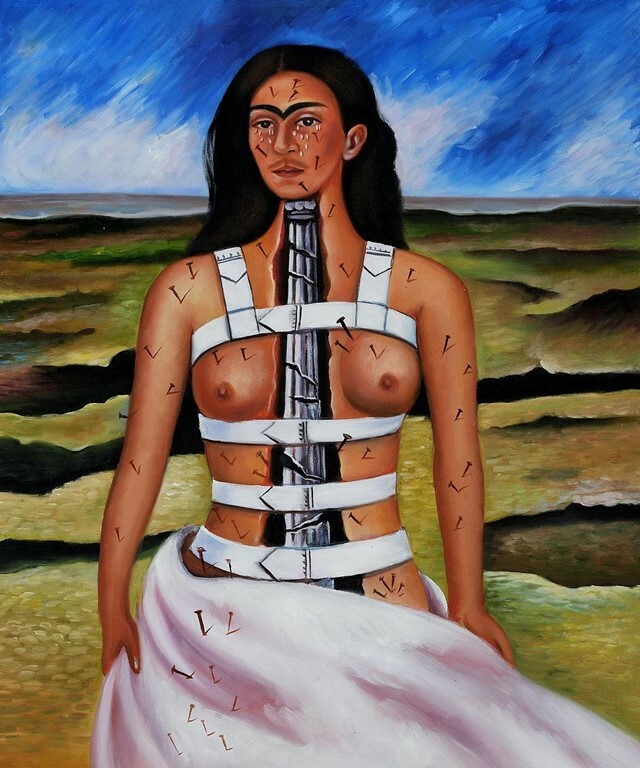 Kahlo suffered an accident when she was only 18, when a trolley she was travelling on crashed, leading to a lifetime of chronic pain, miscarriages, drug addiction, and over 30 surgeries. It is still speculated as to whether or not she willfully overdosed, leading to her death. While her work is almost entirely based on her struggles with disability, this rarely features in mainstream discussion. She was also a fierce communist who hated white people, the USA (which she nicknamed “Gringolandia”), and capitalism. She literally said, “I don’t like the gringos at all. They’re very boring, and they’ve all got faces like unbaked rolls.” You can just about hear the nasal cries of “reverse racism” and “divisive rhetoric” from neo-liberal white women – and yet here they are, rocking polymer Frida Kahlo earrings with reckless abandon. This in itself seems like a wilful attack on her identity. Rather than condemn her, white feminism has embraced her, or at least a ghostly doppelganger in her place; a nicer, lighter reimagining that is free of radicality and hardship. When we discuss Frida Kahlo in the superficial, only through her style, it undermines her ethnicity, her disability and her principles – everything that made her who she was. This ultimately leaves her inaccessible to minority groups while simultaneously allowing privileged people to embrace her without having to come into conflict with aspects of her that contradict their behaviours. It’s no surprise then that Barbie manufacturer Mattel thought it could get away with creating a monobrow-less Frida Barbie doll, and that Theresa May bizarrely thought she could pull off an Esty-esque chunky bracelet with Kahlo’s face neatly framed on all sides. Austerity has led to a worse standard of living for disabled people, ethnic minorities, and women in the UK, so how the Conservative PM could think that her fashion moment was a good move is indicative of how far Kahlo’s appropriation has gone. The forward momentum and marketability of social change has allowed corporations and politicians like May to manipulate culture for their own endorsement, without having to commit to the cause. The same approach can be seen with Martin Luther King Jr., whose quotes are often used by Republican US politicians when they want the black and brown people to calm down. They almost always forget that King blamed the white moderate for hindering the progress of civil rights through need for order instead of justice. Kahlo was very vocal about her beliefs and morals through her art, her relationships (it seems a bit weird to call Trotsky her boyfriend but here we are), and her words. The use of her face as a form of branding and marketing is a direct violation of her anti-capitalist agenda. We can be sure in the assumption that she would not back austerity or want her face on half the tote bags that are out there being filled with organic broccoli. She was 100 per cent down for the cause, but on her own terms. It wasn’t just her eccentric fashion and feisty personality that made her a pioneer – it was her vulnerability, her honesty, and her staunch morality too. It’s important to research and understand our heroines. Refusing to do so means that we are complicit in silencing them in the exact way that we are currently advocating against. Commercialised versions of these women may be helpful in pushing the mainstream brand of feminism and making it palatable to the masses, but removes the crucial things that make these women so inspirational in the first place. If we want to honour their legacies, we have to accept them as they were, as they would want to be seen.